As part of a national and statewide movement, the Women’s March on Washington – Illinois Youth Chapter will join tens of thousands of people in Washington, D.C., January 21st, the day after the presidential inauguration, to stand in solidarity against the hateful rhetoric of this past election cycle. 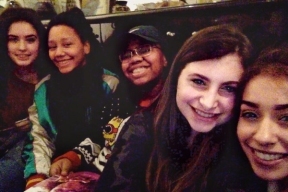 Chicago teenagers Chloe Wagner and Morenike Fabiyi, who are juniors at Francis W. Parker High School, have been working along with the Women’s March on Washington – Illinois Chapter and Chicago Women Take Action to coordinate a group of teens from the Chicago area to travel to Washington to attend the march. Their efforts include raising funds to subsidize the cost for the teens and raising awareness among their peers. “The Illinois Youth Chapter, which consists of a diverse group of teens, will be marching along with thousands of other people in Washington, D.C. to take a stand for the causes that they believe in. The inability to vote for youth under 18 in this past election has left many feeling powerless in our schools and communities. We hope to give rise to a new group of teens who are engaged and active in political communities despite the fact that we are unable to vote,” said Chloe Wagner.